Some of the benefits of driving safely are obvious. But have you ever thought about the gas that you will save by driving the speed limit? Or, the amount of money you will save on car insurance premiums? These little changes add up and will save you money over your lifetime. Money that you could spend as you wish. Being a good driver is much more than just staying out of accidents. 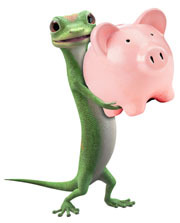 In this special arrangement with GEICO, you can be eligible to receive an insurance discount. There are certain insurer's guidelines which must be followed. Please check with GEICO to determine whether you are eligible to receive an insurance discount or premium reduction after completing this Mature Driver Course. your completion will be automatically reported to GEICO. GEICO should process your discount into your policy within two business days. To start now, simply register with us.